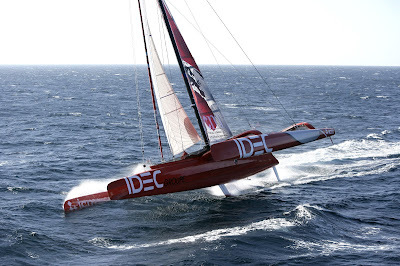 Francis Joyon, skipper of the maxi trimaran IDEC, crossed the Columbus Route finishing line off San Salvador in the Bahamas at 04 hours 57 minutes 30 seconds GMT today Friday 15th February 2013 (0557hrs CET). With a race time of 8 days, 16 hours, 07 minutes, 05 seconds, Francis Joyon shaved more than 1 day and 4 hours off his own record set back in 2008 (9 days 20 hrs 35 mins). Over the 3,884 miles of the Great Circle route, the theoretical route, he sailed at an average speed of 18.66 knots (distance actually sailed 4379.5 miles at an average speed of 21.04 knots). 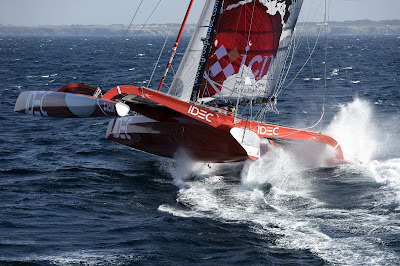 Francis Joyon left Cadiz (Spain) at 12 hours, 50 minutes 25 seconds GMT on Wednesday 6th February. He in fact improved on his previous record by 1 day, 4 hours, 27 minutes and 58 seconds. Indeed he becomes the first sailor ever to take the bar for the Columbus Route to less than 9 days. An exceptional performance, when we see that Francis Joyon looked after his own strategy out at sea without any routing assistance or outside help. 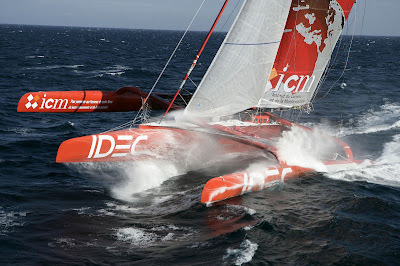 The next challenge for Francis Joyon on IDEC will be an attempt at the North Atlantic record between New York and the Lizard. He is due to go on stand-by in the spring.